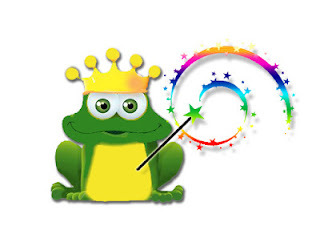 We are going to start to a regular Friday post from the magical Fairytale Wishes Frog Freddy! When I was little girl, I always dreamed of being flower girl. It is such an important role in a wedding and it is one step closer to magical day when I would get married. Sadly, I never had the opportunity. All of my cousins were my age and my aunts were already married. My daughter, on the other hand got to be a flower girl in my sister in laws wedding not to long ago. Imagine if Flower Girl World was around when she got to be a flower girl. There are books and notebooks and celebration kits. Everything you ever wanted to know or dream about being a flower girl. A book from Flower Girl world is such a great way to ask the special little girls in your life to play such an important role in your wedding. 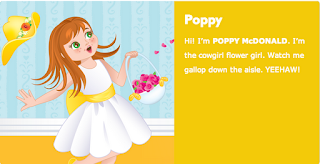 www.flowergirlworld.com has everything you need to know from tips for parents of the flower girl, hair ideas, tips for brides and all of the wonderful stories about the flower girl characters in the books. My daughter would have identified with Poppy because she is a redhead with freckles just like her. Each flower girl has their own personality and style. What a great idea! Happy Thanksgiving to all! All of us at Fairytale Wishes wish you a Gobbly Good Turkey Day! Gail is one of the best women I have ever known. Not because she loves Fairytale Wishes and promotes us any way she she can:), but because she goes out of her way to help any and everybody she can-- just because it makes her feel so good! Her kindness is contagious and I believe I am a better person for just knowing her. Yesterday is the perfect example of what Gail does on a regular basis. She was attending an event at a local venue here in the suburbs of Chicago called Nibbles Play Cafe and invited me to attend with her. There were a group of moms there that were having a fundraiser for the most adorable little girl named Mia who has a brain tumor. This group of Moms have formed a non-profit organization called Creative Caring that plan events that involve their young children doing activities that benefit all kinds of charities. The idea, from what I could tell, is that they take an ordinary play date and turn it into an extraordinary experience for their kids that makes doing things for others part of the fabric of who they are going to be as adults. Yesterday, the kids were helping to make activity boxes for kids that are stuck in bed at the children's hospital here in Chicago. Amazing right? If we could all teach our children what these moms are teaching their kids, the world at large would be a much better place. Gail donates merchandise from her boutique to this organization regularly. Yesterday, I got to meet this extraordinary little girl with such a long road ahead of her. Does she know that there are so many people out there that want to do something to help her? I can't tell you how much pure joy I got from seeing the look on little Mia's face as I gave her very own set of "magic" Fairytale Wishes sprays. It is why I do what I do! If my little company can bring a little magic to every child it is worth all of the hard work I do to get it out there. The world needs more Gail Heratys and more moms like those who started Creatively Caring! I felt honored and privileged to be a very small part of yesterday! Little Mia, you are in my thoughts and prayers and I wish you a full speedy recovery and a Happily Ever After! On my radio show this week, Dhana and I had Dr. Camille Preston on our show and we talked to her about her book Rewired: How to Work Smarter, Live Better, and be Purposefully Productive in an Overwired World. We were especially interested in this topic because we both often find ourselves on our computer with our other technology beeping for attention nearby. What kind of example does this set for our children who are already pre-disposed to be techno-junkies. There are strategies that Dr. Preston talked about which made so much sense and in fact will make us more productive and more communicative. But the trick is to actually implement them into our lives so we do set a good example for our children. My office is in my home. It can be a very unproductive environment. The laundry, the dishes, the unmade beds, dinner, the dog--can all be distractions in making for a productive day. Dr. Preston says that our brains are productive in 60-90 minute increments and then one needs to STOP and take a break. Check emails, return phone calls, fold the laundry. But in that 60-90 minutes, turn off your phone, your email etc. In essence, all outside distractions and your day will be more productive. Today is my first day! My email is off, my phone is turned to mute and my Ipad is in the other room and I am attempting to conquer my list! Tonight, I challenge you to turn everything off at the dinner table. No phones, No Tv's, No computers. Instead tune in to your family. See what happens!